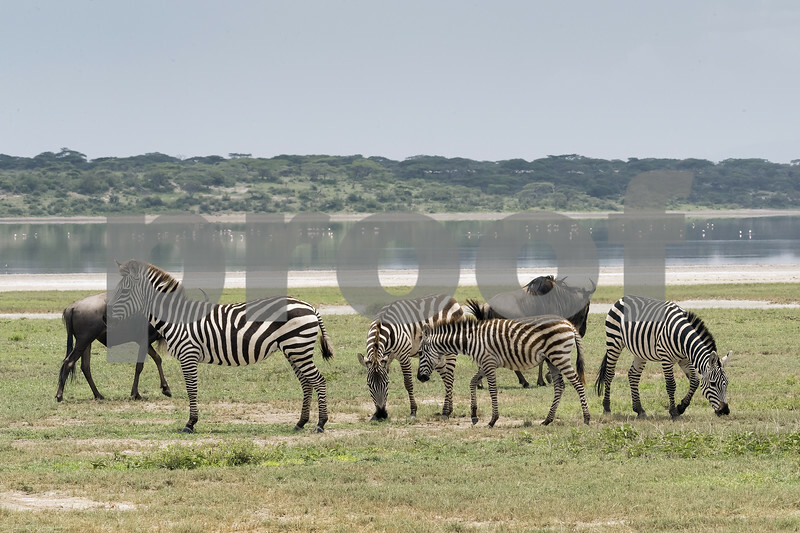 Young and older zebras (Equus quagga) with wildebeest (gnus, Connochaetes taurinus) and distant lessor flamingos (Phoenicoparrus minor) , Lake Ndutu, Serengeti, Tanzania. One of joys of going on safari during the spring rains is the variety and numbers of species that you can see within a small area as the Great Migration moves north with the rains. How cool it would be to see this with one's own eyes. Just and amazing opportunity. It's need too that the Wildebeest is there with the zebras.